The neles ValvGuard testing and monitoring system for emergency valve applications is a new generation safety and management system that helps ensure your valves will always perform in the event of an emergency. Emergency shutdown (ESD) and venting (ESV) valves are the process industry's front line of defense against the catastrophic threat to personnel and equipment posed by fires and explosions. Because many of these valves spend the majority of their time idle, traditional safety systems may not recognize a potential valve failure. 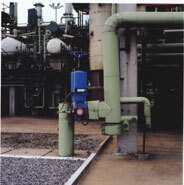 Now you can easily monitor and test valve performance for maximum availability while reducing overall operating costs.